Content by Tony Macklin. Originally published on September 18, 2018 @ tonymacklin.net. Watching the documentary What We Started is an exhaustingly vicarious experience. It throbs and jumps. It captures the spirit, energy, and peculiar power of Electric Dance Music. It's a sporadic, heartfelt history of EDM. 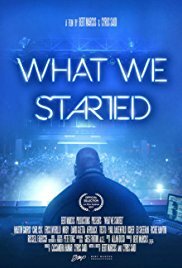 What We Started focuses on several of the creators and practitioners of mixed electronic music, and their individual evolutions. What perhaps is most surprising about What We Started - released widely in 2018 - is how little attention is given to women. What We Started - directed by Bert Marcus and Cyrus Saidi - is totally male dominated. We don't even see the girlfriends of the famous DJs. The movie portrays the creative environment without women. They are only tokens that raise their hands, smile, and gyrate. Females stay in perpetual motion without dialogue. We don't even hear from female fans. A female voice does say about the rave held in England at Castlemorton Common, "20,000, and no toilets." Ah, women and their toilets. Families are also given short shrift in What We Started. Only Carl Cox's sister Pam has a major speech, talking about how their father rejected Carl's passion. DJ Pete Tong says, they all were "lost souls" when they were young, until they found EDM. The phenomenon of phenomena is Martin Garrix, who was born in the Netherlands in 1996. He started mixing music in his bedroom when he was 10 years old. But we rarely see his father - in the credits he is shown wrestling with his son. Carl Cox and Martin Garrix are the two DJs who span the movie. Cox's retirement is featured as is youthful Garrix's appearance at Ultra festival in Miami. Both are icons, although 34 years separate them. Those two events give shape to What We Started. Cox talks about the 10-hour sessions during his career, which showed his unrivaled energy. Near the end of the film, Cox and Martin meet and talk together. Martin marvels at Carl's staying power - 10 hours without repeating a single record. There are other remarkable feats that are chronicled throughout the film: Paul Oakenfeld sold out the Hollywood Bowl. Pete Tong says Tiesto became the "first global superstar," when he performed at The Olympic Games in Greece in 2004. What binds many of the DJs together is a sense of commitment to change and the future. DJ after DJ talks about the potential of underground music. Richie Hawtin mentions one of the virtues of EDM: being with people - "and not having to talk to them." There are a few moments of darkness in a generally upbeat film. The personal travail of the figures is mostly ignored, but the film recognizes the drug culture and the legal and political crackdown on raves that thwarted EDM. But ultimately it survived and prevailed. Moby says, "Drugs play a huge part, too. Sounds are huge. Visuals are huge." Moby says of Martin's music that it "seems to have a lot of integrity around it." But Moby's most insightful remark is, "The crowd is the star." The filmmakers are smart to concentrate on Carl Cox and Martin Garrix - representing the past and the future. Garrix states the universality of music. He says, "Music is the language itself." He is anxious to "keep evolving and stay relevant." Cox and Garrix both exhibit amiable, thoughtful personality. Like their music, they're an enlightening mix. Raise your hands - and watch.